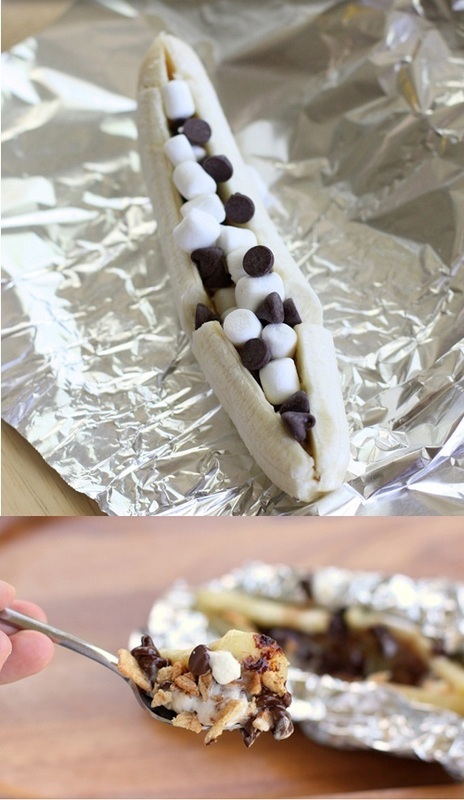 "A banana is sliced down the middle and stuffed to the max with marshmallows and chocolate chips. Wrap it in foil and throw it on a grill for a couple of minutes to get a warm, decadent banana melt. A handful of crushed Golden Grahams cereal on top is all you need to add the graham cracker element of your s’more and the perfect amount of crunch to compliment the gooeyness of everything else. You’re gonna need a spoon for this one … that’s the only way to make sure you get every last morsel of chocolate and melted marshmallow. And it wouldn’t be a s’more if you didn’t get messy. If you can eat this melt using less than five napkins, you are my hero. No grill? No worries. Just throw the foil wrapped banana straight on the cooking rack in a 400-degree oven for 5-6 minutes to get the same delicious result. These are also a classic campfire fave! Just add them to your fire for 3-5 minutes and remove carefully with tongs when the chocolate and marshmallow are melted."